18, 40, 50, 72 or 96 Pack K-Cup Variety Pack made up of 11 Artisan Coffees "No Decaf"
Uptown Blend - An excellent 100% Arabica Dark Roast Bold Coffee. This is a wonderful robust coffee created from premium grade, hard bean coffee. 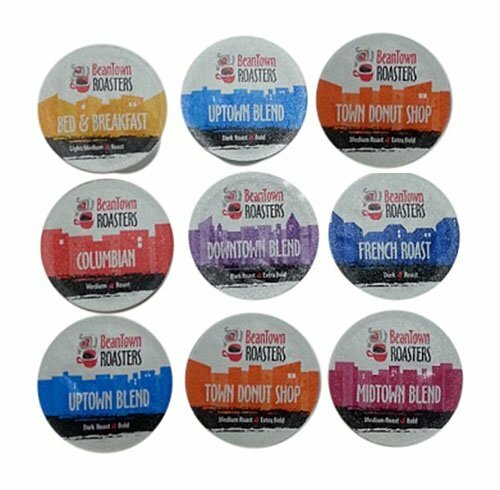 Downtown Blend - A wonderful Dark Roast, 100% Arabica Extra Bold Coffee. Created from the best premium grade HG beans. Midtown Blend - Medium Bold Coffee from 100% Arabica Coffee Beans. Don't like your coffee with too much kick, but still want great flavor? Our Midtown Blend is created from only premium beans. Town Donut Shop - Extra Bold and Dark, 100% Arabica Coffee Beans. You want coffee like your town donut shop brewed in the old days. Here it is, except for one thing. This blend is all premium high quality, high grown coffee beans. So, don't hate us if you happen to like it just a little more. Bed & Breakfast - Top Shelf 100% Guatemalan Arabica Coffee Beans. This coffee is roasted from high end Guatemalan coffee. All beans are premium grade / high altitude grown. French Roast - Very Nice 100% Premium Arabica Coffee Beans. Roasted to French roast perfection. If you like a dark coffee, this may be just the coffee for you. Columbian - Highest Quality 100% Arabica Columbian Coffee Beans. Roasted medium, this premium Columbian is great for all occasions, a wonderful go to coffee. Flavored CoffeeVanilla Bean, Hazelnut and Chocolate Chip Cookie - Highest quality gourmet flavored coffee.